It lost lock at boost, got lock again at apogee (strong winds at FAR apogee horizontal V was 204knots!) This pulled the electronics bay out of the vehicle when the drogue deployed at that speed. Fortunately its a sturdy rocket and it survived a no main chute deploy with minor damage. I will fly a Piksi again recording the Raw RF some time in early Aug.
On a 2nd GPS front PSAS flew a software GPS receiver on their rocket on Sunday. They gathered raw data, but they don't have the full GPS solution working yet. It shows doppler shift in the tracked sats. Doppler is what makes a trains whistle change tone as if goes past. If you change the velocity with respect to a radio transmitter the frequency will shift. There is another effect that can also effect this data... the RF system on a GPS uses a very precise clock (usually a TXCO) in the receiver. That clock may have acceleration sensitivity. I'm somewhat suspicious that the graph above shows this more than Doppler shift. 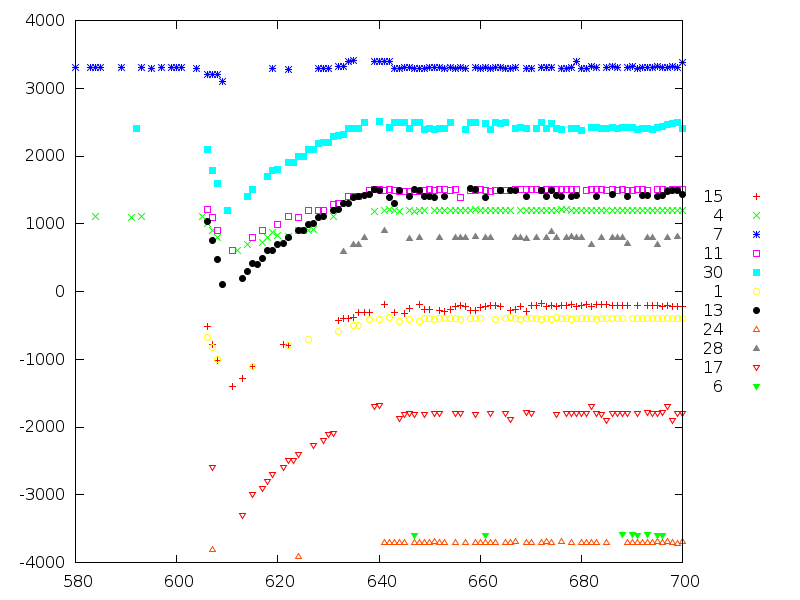 The GPS sats are scattered randomly about, ie some are almost straight up and some are at the horizon. If the rocket flies straight up one would expect a bigger doppler shift for the sat straight over head and much less shift for the sats at the horizon as their relative velocity changes less. Also if the rocket turns into the wind and has some horizontal velocity one might even expect a doppler shift in the other direction for the sat you are flying toward/away from. Given their data the PSAS should be able to determine this. be measured and will give an idea of clock drift. Now take the GPS board and orient it it differently in the 1g gravity field. and generate the doppler graph above... if the doppler shifts with orientation of the sampler board then they probably need a more stable clock. In any case I really applaud what the PSAS guys are doing! How out was it at FAR? Not too bad, I left by 11 am. Interesting blog revival after 2 years. In those 2 years, cubesats have become the big thing. SpaceX & Orbital made headlines, then got snuffed out by accidents. Armadillo was dissolved & John Carmack moved to Facebook. Amazon.com won a government contract for a proof of concept of an engine & NASA lost its funding for yet another shuttle replacement. A degree in journalism program has a great future. You will have news to find and you will have people to read news. Thus, it is an ever growing field of study. Get you online journalism program now from the top accredited college or university. That's the point of the PSAS solution. They don't lose lock under boost because they don't *have* a lock. They record raw RF data, and they can post process it later. If they lose lock while processing, they can go back in time through the data, adjust for G's and reprocess. Not too useful for GPS guidance, but anything with the ability to go to orbit won't leave the pad at 10+ g's, and thus won't lose lock. Say nothing of inertial aiding, which they can develop *off-line* now that they have data. Exciting. Regarding G tolerance, you are correct that the data contains both G effects and doppler, but note that the frequencies look like a rocket's velocity curve, and not the acceleration curve. I think the doppler is pretty close to correct.